Photo: Bin Le Wa Beach. This day trip takes in the local scenery and Bin Le Wa Beach, which isn’t Burma’s most beautiful beach but makes for a fun day out. Located slightly inland up the river estuary, Ye is separated from the coast by around eight kilometres of farmland and paddy. Take the main road west out of town, which leads to Asin, a village near the mouth of the river and the area’s main fishing port. Asin is an interesting spot and well worth a slight detour. Normally you’d turn right immediately after a glass-enclosed Buddha image on the right side of the road, but continuing straight or turning left will take you down to the busy wharves. They rarely see foreigners in these parts and you’ll likely brighten up the fishermen’s day. Stop at one of the very local-style tea shops where you can sit and soak up the fishy but friendly atmosphere. When we visited after the rice harvest we were faced with the odd sight of field after field filled with sheets of drying shrimps. Back on the main road, taking the turn after the old Buddha image will lead you down to Bin Le Wa Beach. 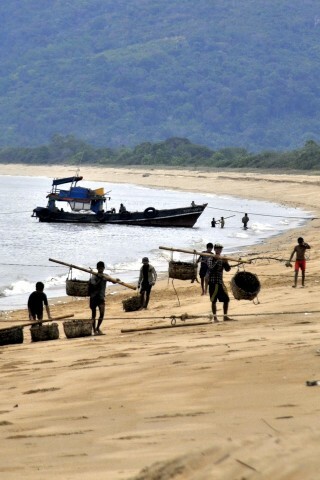 It is long and sandy but much more local in character than even Dawei or Mawlamyine beaches. Much of it is lined with moored longtails, and fishermen play ball games on the beach as racks of drying fish all along the top of the beach give it a pungent perfume. This is certainly not Setse or Maungmakan, and nor does Bin Le Wa have the non-stop seafood restaurants and beer stations you’ll find at those beaches -- though it is nonetheless popular with locals at weekends. A village lines a sandy track just above the beach and tea and curry shops are turned inwards for the benefit of villagers rather than holidaymakers. While not exactly scenic, it is firmly fun. We were told you could follow the track through the village and round the coast back to Asin, but the sandy trail was too much for our motorbiking abilities. After a stroll along the busy beach and brief kick-about with the fishermen, a coffee with local-style sticky rice cake and a chat to the locals in a village tea shop, we headed back past the shrimp fields to Ye. Perhaps more than anywhere along this coast Ye is all about meeting the friendly and highly inquisitive people. Save your sunbathing on pristine sands and parasol-topped beachside cocktails for elsewhere. Remember the locals here have probably never even so much as glimpsed a Westerner -- or indeed any foreigner -- until two years ago. There are apparently other beaches around which either locals or Starlight maybe able to direct you too, but we didn’t explore them this time around. Asin is around five kilometres out of Ye on a decent road and Bin Le Way another couple further on. A short ride by bike or 10,000 kyat for a taxi including waiting time is fair.